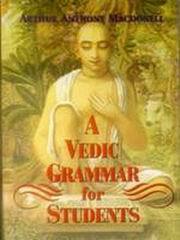 The present work is to a great extent based on the author's large Vedic Grammar. It is however, by no means simply an abridgement of that work. For besides being differently arranged so as to agree with the scheme of his another work Sanskrit Grammar it contains much matter excluded from the Vedic Grammar. It, for example, adds a fully treatment of Vedic Syntax and an account of the Vedic Meters. Thus it constitutes a supplement as well as an abridgement of the Vedic Grammar. The term 'Vedic' is here used to comprehend not only the metrical language of the hymns, but also the prose of the Brahmans and of the Brahmans-like portions of the Atharvaveda and of various recessions of the Yajurveda.